Trying new restaurants around town is fun but sometimes, revisiting old favourites is very enjoyable too. I had a lovely dinner at JK Wine Bar with EC tonight. It's been a few months since we last chatted so we had lots to catch up. When we were taking baking classes together in GBC, we got to meet up once every week. Now that I've completed my certificate requirement, we don't see each other as often as we used to. I ordered the grilled flat bread with three kinds of spreads, grilled sardine with salsa verde, and chicken stew on polenta. EC had the black cod in crab broth and entrecote de boeuf. I normally wouldn't order grilled flat bread. However, since I arrived a little too early, it was a nice snack to munch on while I waited with my glass of wine. When the dish arrived, I was overwhelmed by the rosemary "incense"...the sprig was smoking like crazy. However, one bite into the fluffy warm bread with the delicious spread quickly put away any doubts about the silly presentation. It was absolutely tasty. The sardine was okay but the chicken stew was another winner. I recently developed a preference for the creamy rich taste of polenta. The tomato-based stew was chokeful of shredded chicken and olives. Garnished with some crunchy croutons (they weren't croutons nor lardons...should have saved the menu), this dish was pure comfort food. One thing to note though, it is much more comfortable to visit JK Wine Bar on weeknights. The place felt more relaxing and there's no huge lineup for seats. I used to wonder why anyone would take the time and effort to write letters only to keep it in a drawer, never to be read by the recipient. I now understand because that's exactly what I'm doing. There are so many things that I want to let him know yet I do not tell him. It's not because I cannot muster enough guts to blurt out what I want to say. That's the easy part. The difficult part is to face the inevitable rejection that follows. Inevitable is such a cruel word. It has a ring of finality that makes it so depressing and discouraging. However, sometimes, somethings are truly inevitable. To recognize things that I cannot change and be at peace with this knowledge is to admit defeat. To say that no amount of determination can alter the outcome just rubs against everything that I believe in. I cannot decide what I want to do. Egg is one of my favourite ingredients for any meals, savory or sweet. Whenever I go for sushi, I always save the piece of tamago nigiri sushi for last. It's a wonder that I haven't try making atsuyaki tamago at home sooner, considering how much I like the lightly sweetened egg omelette. After my ski trip, I have a strong craving for eggs. Since I did not have any other proteins readily available in the kitchen, I decided to make atsuyaki tamago for dinner tonight. JT's annual ski trips are always a lot of fun and this year's trip is no exception. After last year's experience in Smugglers' Notch, we're back to Jay Peak this year. It's been uncharacteristically warm this year in the east coast so I was thankful that we had some decent snow on the slopes. Mind you, the condition is far from ideal but at least it was neither too icy nor bare. On the plus side, I must admit that this is the first time that I was not at all bother by the temperature at Jay Peak. In years past, bundling up from head to toe was the norm. This year, just my fleece and shell were enough to keep me warm. Face mask was entirely optional. Snowboarding-wise, I'm currently riding at a level where I'm comfortable with most of the trails on the mountain. This made my trip so much more enjoyable because I could ride (almost) wherever I like without having to plan my routes. I had a great time riding through glades, mogols, and trails wide or narrow with varying degrees of success. With glades and mogols, I have yet to master how to make tighter and faster turns so I was falling quite often. However, it was not so exhausting that I could still have fun. The most memorable experience in this trip was watching JV fell off the trail. I was riding behind him on Derrick's Hot Shot when all of a sudden, he disappeared from the edge of the trail. I was like "OMG" and stopped immediately. I looked down the trail and there he was, holding on to a tree trunk for his dear life. It was a very steep descend into a river with lots of trees and somewhat icy. I tooked off my board and offered to pull him up. Of course, it wasn't much use because after all, JV's 200lb and over 6ft tall. He held on to the tree with one hand and unstrapped his back foot from the board with the other. Slowly, he made his way back on the trail and we had a good laugh. Boys and girls, NEVER fall off the cliff when you ride or ski. After three days of snowboarding, the muscles on my legs are noticeably more toned. Unfortunately, I've added a few bruises and scratches so they're not exactly in the best shape to show off. Battle scars, that's what they are. It dawned on me suddenly. The reason that I've been feeling so miserable is very pure and simple. He no longer likes me but I still like him very much. It has nothing to do with anguish, hurt, or betrayal. Negative emotions can be resolved by taking on a more positive outlook. They are feelings that I can manage. However, what I have on my hands now is a lot trickier. How do I stop liking another person without a healty dose of animosity? We hosted a special event at the restaurant today for La Chaine Des Rotisseurs monthly meeting. Our whole team has been planning for this event for months and it was wonderful to finally put our plans in action. For me, this dinner holds a special challenge because I need to come up with a dessert that can be easily plated for 40 servings in a very short time. After tasting many desserts in Paris, the emotion mahogany from Pierre Herme left a deep impression. The combination of caramel, mango, and lychee was wonderfully harmonious so I wanted to try this flavour combination myself. Napoleon Mahogany: layers of coconut dacquoise, caramel mascarpone cream, lychee compote, mango mousse, and mango gelee. 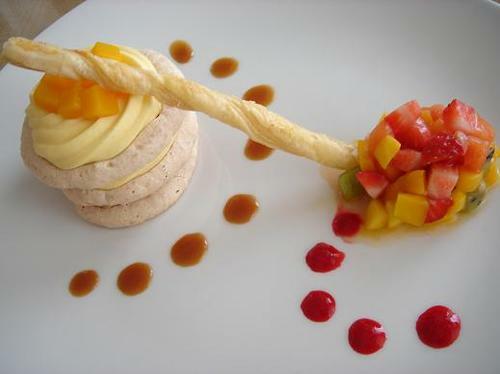 Served with tropical fruit salad, caramel sauce, raspberry coulis, and puff pastry stick. Of all the components, I really really love the caramel. I used to hate cooking caramel but this particular recipe is very easy to cook. It uses a large amount of liquid glucose to keep the caramel fluid. What striked me as interesting was that it requires the cream to be whipped before adding to the caramel. It minimized the sputtering typically happens when adding cream to hot caramel. The finished sauce is very delicious. To make the caramel mascarpone cream, the caramel sauce is used to make a caramel creme anglaise (with gelatin). After everything is chilled, the caramel creme anglaise is mixed with equal part mascarpone cheese. It is different than anything I've made before. I can't believe what I did today. I talked to you against my better judgement yet I didn't know what I wanted to say when I opened my mouth. I ended up telling you about all the things that the rational side of my mind had been preaching to me day in and day out. That was not the reason that I wanted to talk to you. All I wanted to say was that I still like you very much despite my sensibility. What I ended up was asking you to leave me alone so I can get well. Why do I keep on saying things that I don't want to say for the sake of doing the correct thing? I'm so tired of doing the right thing. It keeps me from getting into trouble but it also keeps me from chasing after what I really want. When I go shopping, there's a category of clothes that I label as motivational. Of course you know what I'm talking about. It's the kind of clothes that you take one look and can just picture in your mind how gorgeous it would look on a toned body. Next you take a glance in the full-length mirror and let out a sigh. To me, such clothes include anything that reveals the navel or anything that highlights the arms. I tried on a blouse (and I use that term loosely) today that made me want to hit the gym and do situps like there's no tomorrow. Typically, I do not like the clothes at Guess or their expensive label Marciano because they are too body-conscious and just screams clubbing to me. However, I always have a soft spot for butterfly sleeves so this blouse from Marciano really caught my eye. At $178CAD, I wasn't tempted to own this motivation in my closet. I tried it on and surprisingly, it didn't look so bad on me. Only problem is, I wouldn't be able to sit and still maintain any dignity...well, here's to situps and 6-packs! I was not particularly inspired to cook tonight so I just put together a simple meal with whatever I could find in my kitchen. 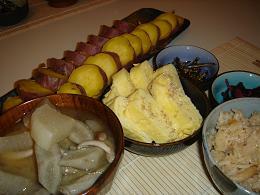 One of my favourite items in an oden is fukuro-ni, which is a pocket of aburage (deep fried tofu) filled with mochi. Seeing that I have both ingredients available, I made two for the soup tonight. I first sliced the aburage in two and split open the pockets. I filled each pocket with a piece of mochi and tied each pocket with a length of blanched green onions. 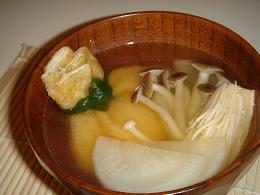 The assembled fukuro were cooked in dashi along with slices of daikon and assorted mushrooms. The end result was a nice soft chewy mochi soaked with the flavour of the broth. You are the cause of my sadness yet you are blind to my struggles. I am worry about you yet I can only watch and respect the choice you made. I want to speak my mind yet you do not need to know. And the reason for all of this grumpiness? The way I want to react is no longer in the script of the role that I play. I need to stop thinking now because my thoughts are messing with my emotions. None of this is real...I'm just imagining things and it's all in my head.